ACCRA, May 15 2009 (IPS) - Ghanaians are daily consuming genetically modified (GM) products imported by various traders without much care. However, as the government prepares to allow the planting of GM crops locally in a bid to boost food production, one non-governmental organisation, Friends of the Earth (FoE) Ghana is sounding the alarm. Field trials of GM crops in Ghana began in May 2008, regulated by existing legislation coverying the conduct of research in general. A Biosafety Bill that will establish a framework for the commercial growing of genetically-modified crops in the country is presently before parliament. For 2009, finance and economic planning minister Dr Kwabena Duffuor said Ghana has targeted increases of 42.2 percent for maize and 22.8 percent for rice. The production of groundnuts, cowpea and soyabean are projected to increase by 25.4 per cent, 37.7 per cent and 11.5 per cent, respectively. Some scientists have suggested that the country will need to find new ways to improve agricultural productivity if the government’s target is to be met. Q&A: "Transgenic Seed Companies Lie and Bribe"
Agyepong says GM crops are different from conventionally-bred hybrids which have been properly researched. “Unfortunately, a decade after the talks about GM, we are still in the dark and it is important that we wait for more research to be conducted so that we know, for instance, how GM contamination can be contained.” Contamination refers to the spontaneous cross-pollination of GM crops with others, which can spread genetically-modified genes into conventional harvests and wild plants. This position is backed by the ActionAid International, a global non-governmental agency which says the impact of GMOs on health and the environment has not been ascertained. “Even the producers of GMOs do not fully know how the introduction of foreign genes affect human beings or plants, when the foreign gene combination is likely to break away and what effect it will have in the human body or plants,” said Eric Mgendi, ActionAid’s international coordinator for communications in Africa told IPS. Several GM crop varieties have been designed to have a higher resistance to herbicides, allowing farmers to use greater quantities to kill weeds while sparing their crops. Mgendi claims that GMOs have accelerated the emergence of super weeds – weeds with strong resistance to herbicides and pesticides. Campaigners say the increased use of pesticides – whether to control these weeds or as part of growing GM crops – contributes to damaging the productivity of farmland over time. Washed into rivers or lakes, these herbicides have been known to affect plant and animal species – a case in point is the heavy use of chemicals in the flower farms in Naivasha, Kenya and the effect on fish and other animal species in Lake Naivasha, where fish with two heads have been found. Prof Alhassan said conventional farming is not without its problems. 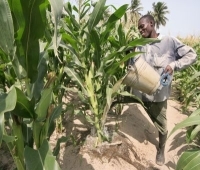 “Maize farmers, for example, use sprays on their crops and these chemicals pollute the atmosphere as well affect the health of the farmers over a long period of use.” But, he says, this has not prevented the use of the chemicals but rather work continues to improve their safe usage. As the arguments rage on, the Ghanaian population seems to be largely indifferent. At Makola Market in Accra, one could spot various brands of soy cooking oil on sale. Adwoa Antwi, one trader who obviously did not know the meaning of GM, had a few gallons on display. “For me, it is just cooking oil that l am selling and l do not know what is written on it.” She admitted that those who come to buy do not bother to read the label. Thus, FoE’s campaign against the introduction of GM in Ghana seems to be facing an uphill task. Very little understanding by the population on whose behalf they are fighting, coupled with reduced funding for their work in Ghana by FoE International as a result of the global credit crunch – while their opponents continue to enjoy increased support from the global bio-tech industry – it is becoming clear that FoE may not win the fight.